67 new rikishi joined the banzuke in May 2008. As usual, we observe a large number of recruits who passed their mae-zumo tests at the last Haru basho. Let us recall that this traditional abundance is due to the fact that this time of year corresponds to the end of the academic year ; these are, therefore, all young people finishing their studies who are making their debuts. This year's recruitment, however, was marked by a general anxiety on the part of the recruits' parents following the Tokitsukaze business. As a result, many young people seem to have decided in the end not to try it, for fear of the roughness of the sumo world. Chikarayama joins the heya directed by his father Arashio oyakata, despite the reluctance of his family and his low weight (69 kg). Isamizuki brings a helping hand with his 206 kg(!) to Sakaigawa beya. Takanohana oyakata has recruited a deshi for the third time since he has been in charge of his stable and for the first time in 4 years: Takatenshu, of good size, but without any success in mae-zumo. Tsuya is originally from China, but is officially listed as coming from Akita prefecture since Naruto beya already has an "official" foreigner, in the person of Takanoyama. Fifteen rikishi managed to put together two wins and no losses in mae-zumo, and are therefore ranked highest on the banzuke. These rikishi, unbeaten in mae-zumo, are the shinjo-shusse. The other deshi with a positive or balanced scorecard are the niban-shusse (see the results below). If many heya failed to recruit new deshi, some knew how to apply persuasion, convince the families and recruit in bulk: nine recruits for Hakkaku beya, six for Naruto beya and five for the always vigorous Shikorayama beya. Then come Tamanoi, Nakamura and Tagadagawa with four each, then five heya with three recruits, including Michinoku beya, which confirms its current good form as regards recruitment. The Hisato twins from Takadagawa beya, natives of Hiroshima prefecture: on the left, Akinokawa (Mitsuhiro), jonokuchi 21 east, "I want to fight for as long as possible, doing the sumo that I love." On the right, Akinoyama (Hideaki), jonokuchi 10 east, "I want to become stronger by building up the training quickly." The highest ranked of the three recruits from Sadogatake beya - Kotoenomoto (Yuki Enomoto, native of Kagawa prefecture on the Isle of Shikoku), jonokuchi 11 west. 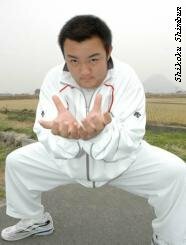 He began sumo in the third year at primary school and eventually left high school to become professional. Courted by several stables, he chose Sadogatake. "In this stable, I'm sure to become strong." Osanai (Yuya Osanai, native of Hokkaido), jonokuchi 12 west, from Kitanoumi beya. Discovered very early, he has been doing sumo seriously since primary school. From the vantage point of his 15 years and 1.8 m, he knows what he wants: "My target is makuuchi division." The heavyweight of the group has joined Sakaigawa beya: Isamizuki (Naoya Miyazaki, native of Nagasaki), jonokuchi 14 west. Upon the announcement of his weight at the shindeshi kensa, even he was surprised : "That is a record for me!" 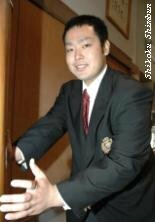 Kamei (Takashi Kamei), jonokuchi 17 west, Kise beya, also started sumo at primary school and comes from Nichidai University. 1.92 m, 130 kg with a shoe size of 32 cm. The Mayor of his home town of Zenjitsu (Kagawa prefecture), who has seen him fight since his childhood, has high hopes for him: "If he becomes sekitori, there must definitely be a tournament in Zenjitsu!" Another recruit from Hokkaido, Nakayama (Makoto Nakayama), jonokuchi 19 east, Hakkaku beya, also has a well-defined ambition: "The current Yokozuna are foreigners. So I am going to do my very best to be able to become a Japanese Yokozuna." Fukudome (Mishio Fukudome), jk 25 west, Hakkaku, ex-rugby player. Chikarayama (Riki Suzuki), jk 39 east, Arashio, skinny son of his father and oyakata. Takatenshu (Kanata Matsubara), jk 43 east, Takanohana, long-awaited recruit of Takanohana oyakata. Honour where honour is due : Kido (Yoshitaka Kido), Kasugayama. He is banzuke-gai (unranked). Table listing rank, shikona, date of birth, height, weight, heya affiliation, and maezumo record for all new recruits.